I've been a T-Mobile customer for, like, dog's years forever. 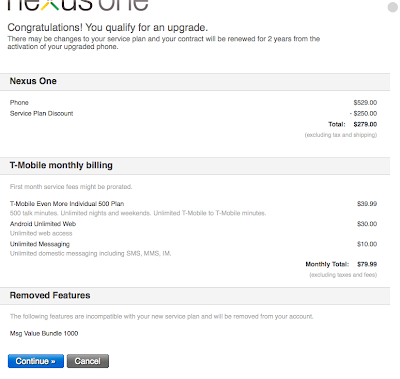 But instead of the new-user $179 pricing on the Google Nexus One magic super Harry Potter vampire glitter phone android thing that was just released, I'd have to pay $279 to get it. I haven't had an upgrade on my phone in, also, dog's years. If inflated pricing is what loyalty buys at T-Mobile, I'm not getting one of these doodads. It's a lose-lose situation, sigh.